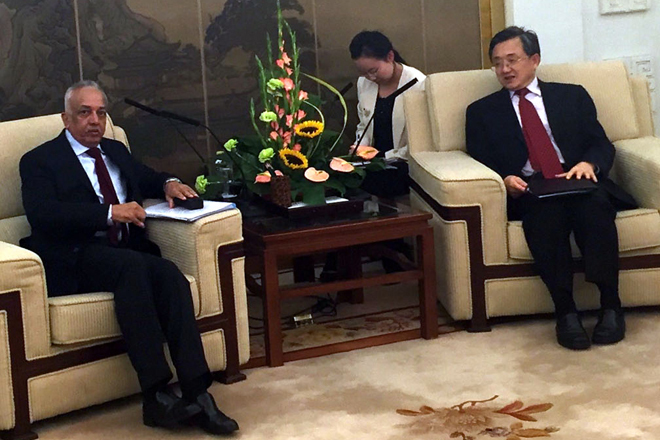 Mar 03, 2016 (LBO) – Prime Minister Ranil Wickremasinghe’s forthcoming visit to Beijing is being eagerly awaited by the Chinese leadership as a timely opportunity to strengthen bilateral relations, the BOI said in a statement. Chinese Vice Minister of Foreign Affairs Liu Zhenmin has assured Minister Malik Samarawickrama that Chinese authorities are committed to achieving significant outcomes from the PM’s visit next month. The BOI statement said the meeting among the ministers in Beijing focused on the PM’s visit and economic issues of mutual interest. “The Chinese authorities are looking forward to welcoming Mr Wickremasinghe on his second visit to Beijing as Prime Minister, following a previous trip in 2003,” the statement said. “He will be hosted by the Chinese Premier Li Keqiang. The Sri Lankan premier will also meet with President Xi Jinping. It is expected a Joint Statement would be issued at the end of the visit summarizing the issues covered. These are likely to include cooperation documents involving China’s assistance to Sri Lanka such as the support to build a kidney hospital as well as assurance related to China’s Maritime Silk Route Initiative. Parallel events have also being planned to promote Investment, Trade and Tourism during the PM’s visit. Minister Samarawickrama has briefed Vice Minister Zhenmin on the acceleration of on-going Chinese projects in Sri Lanka and the government’s development plans which offer considerable opportunities for Foreign Direct Investments, including from China. The scope for bilateral co-operation has also been explored, particularly for catalyzing infrastructure investments. “The Chinese minister has indicated both the Parties in the current coalition government in Sri Lanka were friends of China,” the statement said.